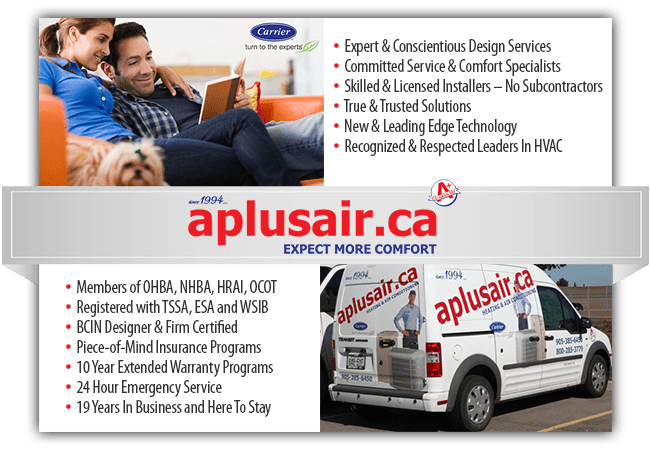 What started out as a husband and wife team in early 1994, has grown to become one of Hamilton and Niagara regions largest independent award winning heating and air conditioning, fireplace and IAQ centres. With 1 centrally located head office, over 25 specialists, 17 service trucks and 1 huge focused attitude on selling comfort -- we are a family business! Not because every employee that works for us is a relative, but because they are a part of the A-Plus family; each dedicated to their career in the same way. We began with a "let them think we're big" marketing attitude and ended up with big shoes to fill. It's not always easy competing with the big guys, but more than 19 years later, this BIG little company has proven that we can provide very competitive brand name products, prices and services without our customers being caught up in voice mail, contract conditions, mergers or acquisitions. This is more than you might expect from a typical heating, ventilation and air conditioning (HVAC) provider, but that's the whole point. We’re inspired by great people who build great homes. We’re inspired by people who are as passionate about their HVAC systems as they are of their kitchen cabinets. It's not just a box in the basement, it's home comfort. It's what we do!